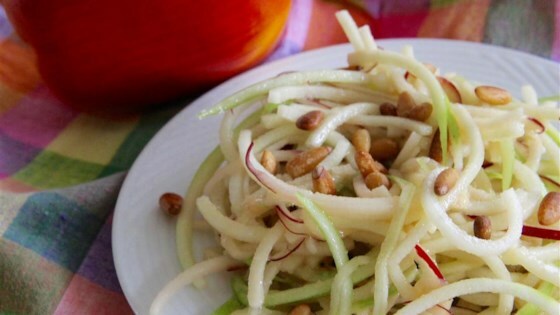 "Let the spiralizer do all the work for you and then enjoy a fresh, crisp, crunchy apple salad with a mild vinaigrette dressing that comes together in minutes. You can use whatever apples you like just as long as they're fresh and have a firm texture. To keep the apples crisp, add the vinaigrette dressing right before serving." Whisk olive oil, white balsamic vinegar, Dijon mustard, and honey in a small bowl to make dressing. Cut Granny Smith and Red Delicious apples into noodles using a spiralizer fitted with the large shredding blade. Place apple noodles in a large bowl and toss with lime juice to keep them from turning brown. Pour in dressing; mix gently until salad is combined. Place pine nuts in a small skillet over medium-low heat. Toast pine nuts, shaking often, until golden brown, about 5 minutes. Sprinkle pine nuts over salad. If you don't have white balsamic vinegar, good substitutes would be rice vinegar or white wine vinegar (you want a mild-flavored vinegar, not cider vinegar).